Larva of Blanket Octopus,Tremoctopus gracilis (Eydoux & Souleyet, 1852) Tremoctopodidae. 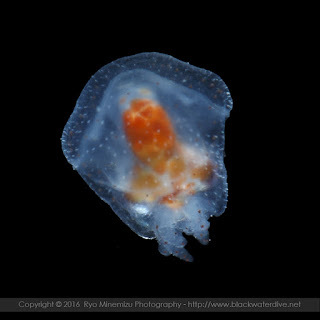 This larva of a Blanket Octopus was taken at Omi Island Yamaguchi Prefecture Japan. Omi Island is located in the Sea of ​​Japan coast of Yamaguchi Prefecture. This larva of mantle length was about 4mm. Mantle is translucent, brachial membrane envelops head and arms. Ciliary process are lined to Mantle. Among the larvae of the arm, dorsal arms is the most developed and the other arm is quite short. Dorsal arms has very large suckers. Sucker is gradually to bigger from the tip, and the largest sucker is fourth from the tip. Web of arms is not yet developed. Chromatophores present on inner edge of each sucker, and absent on funnel. 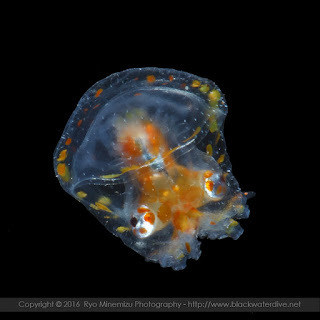 Orange large iridophores are arranged around the eyes. Mantle typically triangular in shape. Dorsal mantle scattered with chromatophores. Large eyes are facing the ventral. Ventral mantle patterned with a band of yellow from red chromatophores along anterior margin. Often, adult of Tremoctopus gracilis appear to Omi Island in late summer. 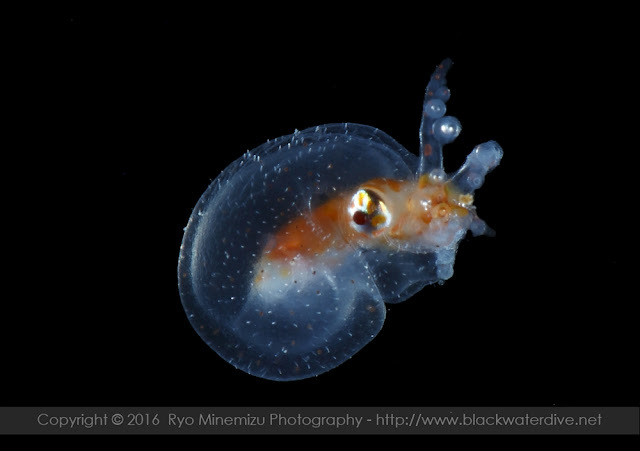 Genus Tremoctopus are pelagic octopus that live on the surface to 250m. And also known to feed on Pteropod Molluscs and small fishes. Larva often known that hold on Physalia tentacles in arms I and II.